Need some rocking chair replacement cushions to spruce up an old rocker? Not to worry, they're readily available in stores and online, and they're also very easy to make. With some new cushions you can make your old rocking chair look like new in no time. Cushions add comfort and style to hard rockers. While there are upholstered versions available, traditional wooden rocking chairs are still very popular (as are aluminum, rattan, and other materials). Adding cushions to them not only enhances the comfort factor, it gives them a softer look and can add a splash of color and style to the room. More importantly, rocking chair cushions provide body support. Sitting in a hard chair for a long period of time can cause back pain after a while, so adding a supportive cushion can help minimize the negative effects. When cushions start to get flat and frayed from overuse, it's important to get replacements. When purchasing replacement cushions for your rocker it's very important to get the right size. If the cushions are too small they won't offer you the proper support. In order to maximize the benefits of the rocker, you'll want cushions that support your lower and middle back. If the cushions are too big they will be crammed on the seat and again, not provide the proper support. Most stores that sell rocking chair cushions will have some that properly fit various rockers, but if you can't find what you're looking for, consider having some custom made. Test them out and make sure that the back cushion reaches at least halfway up your back. Anything else is too small. Traditionally rocking chair cushions have been largely flat, but in recent years box cushions have become quite stylish and popular. They've become particularly popular for outdoor rocking chairs. Box cushions are thicker than average pillows and add depth and dimension to the chair. Test out both options to see which feels most comfortable. When choosing replacement cushions you want something that will add extra comfort and support to the chair, but also you want it to look good. Think about fabric styles and materials. What is the most practical? Do you live in a humid climate where a light breathable fabric is best, or is a heavy, rich fabric better for your surroundings? Do you want the cushions to stand out in the room or blend in? Think about all of these things before buying. When buying rocking chair replacement cushions, it's important to get a fabric and style that suits the chair as well as the décor of the room, but what's even more important is to get cushions with the proper filling. Cushion inserts and filling come in a few basic varieties. Think about your needs and what your budget can handle before deciding what type to purchase. Foam - Slightly stiff but tends to hold its shape. Foam is inexpensive and usually lasts a long time. Cotton Batting - Inexpensive but it's reflected in the quality. Cushions full of cotton batting tend to get lumpy and have to be replaced more often than the foam variety. Down - It's soft and luxurious, but has to be constantly fluffed to get its shape back after anyone has sat in it. It's not great for long periods of sitting. Blends - Down and feather blends are popular because they hold their shape fairly well and are moderately priced. They rate fairly high on the comfort scale as well. Whenever possible, buy cushions with zip closures so the inserts can be taken out. Not only does this make washing easier, it's far more convenient and cost effective if either the filling or material wears out. You can replace one without having to replace the other. Most large home stores carry replacement cushions for rocking chairs, but the selection is rarely as good as the selection of accent and throw pillows. 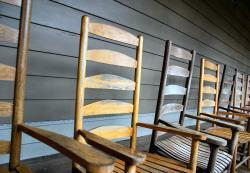 There are many sites and online stores that specifically sell rocking chair cushions. One such site is Cushion Source, but you can also check out stores like JC Penney, Target, and Pottery Barn. When you buy online you have to pay to have the items shipped, but it's often much easier to find exactly what you want. Of course, if you can't find what you're looking for, you can always make your own replacement rocking chair cushions. If you're not handy with a needle and thread, have some custom-made. No matter what you decide, be sure to get something of quality that provides great style and support.